Situated remarkably near some of the major attractions in the city, the Danubius Health Spa Resort Grandhotel Pacifik Marianske Lazne is a good choice for all kinds of travelers. The Singing Fountain is just a short distance from the site, and the Spa Colonnade and Caroline's Spring are nearby as well. A guest could reach the golf course or the Cableway in a matter of moments, and the major dining and shopping of the area is close to the hotel too. Other attractions within walking distance are the Goethe and Muse sculpture and Ferdinand's Spring. 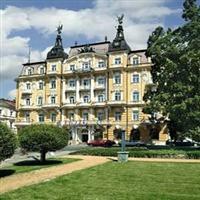 The Danubius Health Spa Resort Grandhotel Pacifik Marianske Lazne is located at Mirove Namesti 84 and is 19.1 miles from the Karlovy Vary International Airport. Each guestroom in the Danubius Health Spa Resort Grandhotel Pacifik Marianske Lazne is supplied with high-speed Internet access, a minibar, satellite TV, a personal safe, and a large private bathroom. Those staying at the Danubius Health Spa Resort Grandhotel Pacifik Marianske Lazne will be able to rely on many amenities which include airport shuttles, 24-hour front desk service, child care options, banqueting facilities, a lounge with bar service, a business service center, a concierge desk, meeting and conference rooms, a currency exchange, free daily breakfast service, a spa with massage and beauty treatments, pet friendly policies, an in-house restaurant, a swimming pool, a sauna, and a tour desk.